The process of cutting thin strips for laminations is a reductive one. As I don’t have a band saw, I’m using a table saw with a blade that is just shy of 1/8 thick. So for every 1/8″ thick strip I cut, I loose as much in sawdust. 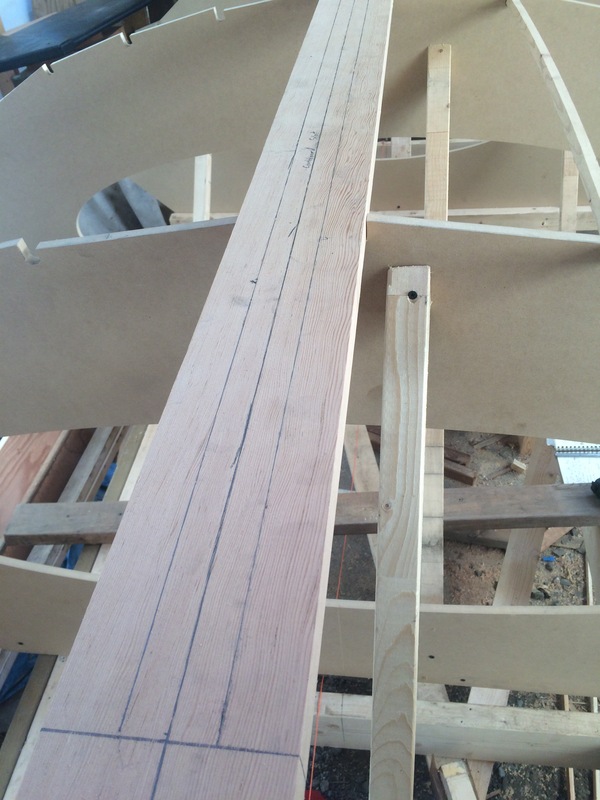 I have ﻿just two more 2×3 boards to rip and I’ll have everything I need to glue up the bow and stern apron and stem. I’m finally making headway and ripping the VG douglas fir into 1/8″ by 2 1/2″ strips for the apron and 1/8″ by 2″ strips for the stem of the stern. I’ll have to repeat the whole process for the bow apron and stem. Last scarf, moving on to the aprons and stems. This weekend I was able to get back up to speed on my Caledonia yawl project after missing a week. I glued one of the two scarfs on strake 2 and will leave the other to do when I’ve got the station molds up as there is the most twist in the forefoot of strake 2 and it will be easier apparently to glue it down first and then do the scarfs. Scarf clamping mechanism. the 2×4 is screwed to the 3/4″ plywood to keep it from warping. It was then time to tackle the apron and stems of this Caledonia Yawl. I’ve decided to try the method of laminating thin strips 1/8″ of Douglas fir with epoxy and West system 403 microfibre additive. The part I’ve been struggling with is that in Ian Oughtred’s plans the apron is 2″ wide. So I need to find a stock of wood that is at least 2.25 or 2.5 inches wide so that after it is laminated I have a little margin to plane it down and fair it. Punching through the plans to create a pattern for the mould that will be used for the lamination. But all the standar lumber jumps from 1.75″ to 3.5″ and it seems wasteful to rip down a 4×4 timber just to get something 2.5″ wide. After a visit to a couple lumber yards I decided to get a few vertical grain clear 2×3’s and rip them along the wide edge to get the width of strips I need. 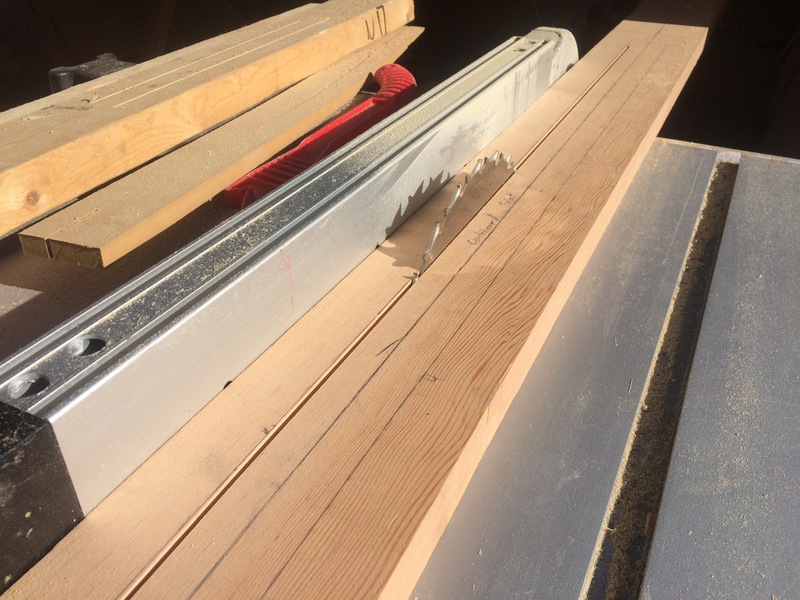 The stems are only specified to be 1.75″ wide and so I am able to use rough fir 2x4s to cut the lamination strips and I’ll have 1/4 inch of material to plane off and to keep it true. Transcribing the bow apron and stem pattern. After using my full sized plans of the bow and stern apron and stem to punch through all the reference points onto my pattern board. I traced it all out again. laying out the blocks I will use to clamp the laminated wood. Note that I’ve also put down packing tape to make sure the epoxy won’t stick to the pattern.